This section provides a compiled list of prominent companies working on castor oil. Basic grades of castor oil, Ricinoleic acid, Hydrogenated Castor Oil (HCO) and 12-HSA. Manufacturing and exporting of castor oil and its derivatives. 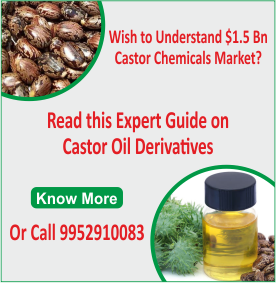 Manufacturing castor oil and its derivatives. Manufacture various grades of castor oil & castor seed extraction. Sree Rayalseema Alkalies & Chemical Ltd.
Tongliao TongHua Castor Chemical Co., Ltd.
Castor oil basic grades, dehydrated castor oil, hydrogenated castor oil, 12-HSA, sebacic acid, castor oil fatty acid, dehydrated castor oil fatty acid, pharmaceutical castor oil, blown castor oil, sulphonated castor oil, lithium 12-HSA, magnesium 12-HSA, aluminium 12-HSA and other stearate products and Dioctyl Stearate (DOS), Dibutyl Sebacate (DBS), Dioctyl Fumarate (DOF), Dibutyl Fumarate (DBF), Dodecanedioic Acid, secondary octyl alcohol, commercial stearic acid, castor meal. Zouping County Tianxing Chemical Industry Co., Ltd. Produces castor oil basic grades, sebacic acid and 12-hydroxy stearate. Liaoyang Huaxing Chemical Co., Ltd.
Xingtai Lantian Fine Chemical Co., Ltd.
- 2018 Powered by CastorOil.